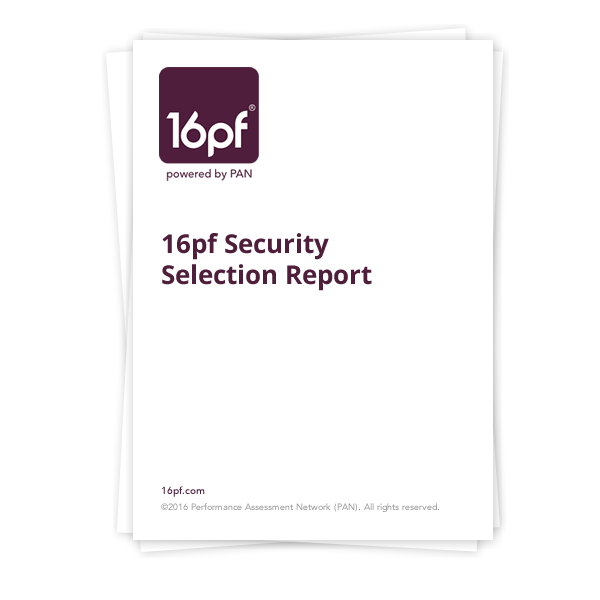 The 16pf Security Selection Report (16pf SSR) is used to evaluate applicants for security and other public safety positions. It is a quick and cost-effective selection tool that can be used by HR professionals and recruiters to distinguish between applicants who are likely to be effective performing assigned duties and those who could be at risk for performance problems. A 3-color rating system (Low Risk, Average Risk, High Risk) is used for the Overall Recommendation, which is calculated from the ratings on all four of the 16pf Protective Services Dimensions. If an applicant is categorized as either Average Risk or High Risk on any of the four dimensions, the report suggests follow-up questions for the evaluator to further explore each area of concern during the interview process. The report is generated from the 16pf Questionnaire, a widely-respected assessment of adult normal personality that takes just 25-35 minutes to complete via the Internet. It is research-verified as a valid and reliable tool for use in the public safety and security field, and meets all applicable hiring laws including EEOC and ADA compliance.